The capacitor's function is to store electricity, or electrical energy. The capacitor also functions as a filter, passing alternating current (AC), and blocking direct current (DC). This symbol is used to indicate a capacitor in a circuit diagram. The capacitor is constructed with two electrode plates facing eachother, but separated by an insulator. When DC voltage is applied to the capacitor, an electric charge is stored on each electrode. While the capacitor is charging up, current flows. The current will stop flowing when the capacitor has fully charged. When a circuit tester, such as an analog meter set to measure resistance, is connected to a 10 microfarad (µF) electrolytic capacitor, a current will flow, but only for a moment. You can confirm that the meter's needle moves off of zero, but returns to zero right away. However, in the case of alternating current, the current will be allowed to pass. Alternating current is similar to repeatedly switching the test meter's probes back and forth on the capacitor. Current flows every time the probes are switched. The value of a capacitor (the capacitance), is designated in units called the Farad ( F ). The capacitance of a capacitor is generally very small, so units such as the microfarad ( 10-6F ), nanofarad ( 10-9F ), and picofarad (10-12F ) are used. 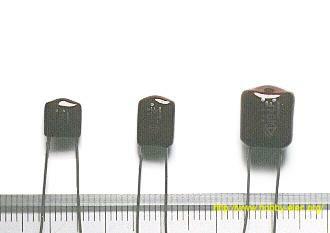 Recently, an new capacitor with very high capacitance has been developed. The Electric Double Layer capacitor has capacitance designated in Farad units. These are known as "Super Capacitors." Sometimes, a three-digit code is used to indicate the value of a capacitor. There are two ways in which the capacitance can be written. One uses letters and numbers, the other uses only numbers. In either case, there are only three characters used. [10n] and  denote the same value of capacitance. The method used differs depending on the capacitor supplier. In the case that the value is displayed with the three-digit code, the 1st and 2nd digits from the left show the 1st figure and the 2nd figure, and the 3rd digit is a multiplier which determines how many zeros are to be added to the capacitance. Picofarad ( pF ) units are written this way. For example, when the code is , it indicates 10 x 103, or 10,000pF = 10 nanofarad( nF ) = 0.01 microfarad( µF ). If the code happened to be , it would be 22 x 104 = or 220,000pF = 220nF = 0.22µF. Values under 100pF are displayed with 2 digits only. For example, 47 would be 47pF. The capacitor has an insulator( the dielectric ) between 2 sheets of electrodes. Different kinds of capacitors use different materials for the dielectric. 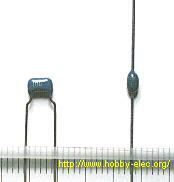 When using a capacitor, you must pay attention to the maximum voltage which can be used. This is the "breakdown voltage." The breakdown voltage depends on the kind of capacitor being used. You must be especially careful with electrolytic capacitors because the breakdown voltage is comparatively low. The breakdown voltage of electrolytic capacitors is displayed as Working Voltage. The breakdown voltage is the voltage that when exceeded will cause the dielectric (insulator) inside the capacitor to break down and conduct. When this happens, the failure can be catastrophic. I will introduce the different types of capacitors below. Aluminum is used for the electrodes by using a thin oxidization membrane. Large values of capacitance can be obtained in comparison with the size of the capacitor, because the dielectric used is very thin. 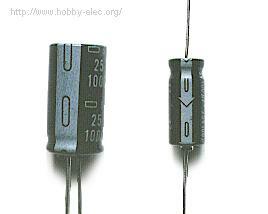 The most important characteristic of electrolytic capacitors is that they have polarity. They have a positive and a negative electrode. [Polarised] This means that it is very important which way round they are connected. If the capacitor is subjected to voltage exceeding its working voltage, or if it is connected with incorrect polarity, it may burst. It is extremely dangerous, because it can quite literally explode. Make absolutely no mistakes. Generally, in the circuit diagram, the positive side is indicated by a "+" (plus) symbol. The photograph on the left is an example of the different values of electrolytic capacitors in which the capacitance and voltage differ. sizes shown here on this page are just examples. In the photograph to the right, the mark indicating the negative lead of the component can be seen. You need to pay attention to the polarity indication so as not to make a mistake when you assemble the circuit. Tantalum Capacitors are electrolytic capacitors that is use a material called tantalum for the electrodes. Large values of capacitance similar to aluminum electrolytic capacitors can be obtained. Also, tantalum capacitors are superior to aluminum electrolytic capacitors in temperature and frequency characteristics. When tantalum powder is baked in order to solidify it, a crack forms inside. An electric charge can be stored on this crack. These capacitors have polarity as well. Usually, the "+" symbol is used to show the positive component lead. Do not make a mistake with the polarity on these types. Tantalum capacitors are a little bit more expensive than aluminum electrolytic capacitors. Capacitance can change with temperature as well as frequency, and these types are very stable. Therefore, tantalum capacitors are used for circuits which demand high stability in the capacitance values. Also, it is said to be common sense to use tantalum capacitors for analog signal systems, because the current-spike noise that occurs with aluminum electrolytic capacitors does not appear. Aluminum electrolytic capacitors are fine if you don't use them for circuits which need the high stability characteristics of tantalum capacitors. The photograph on the left illustrates the tantalum capacitor. The "+" symbol is used to show the positive lead of the component. It is written on the body. Ceramic capacitors are constructed with materials such as titanium acid barium used as the dielectric. 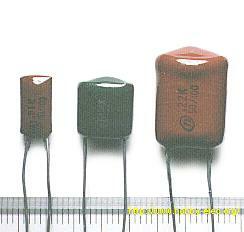 Internally, these capacitors are not constructed as a coil, so they can be used in high frequency applications. 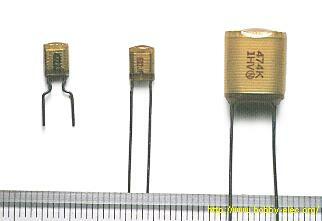 Typically, they are used in circuits which bypass high frequency signals to ground. These capacitors have the shape of a disk. Their capacitance is comparatively small. The capacitor on the left is a 100pF capacitor with a diameter of about 3 mm. The capacitor on the right side is printed with 103, so 10 x 103pF becomes 0.01 µF. The diameter of the disk is about 6 mm. Ceramic capacitors should not be used for analog circuits, because they can distort the signal. The multilayer ceramic capacitor has a many-layered dielectric. 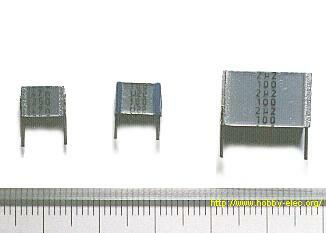 These capacitors are small in size, and have good temperature and frequency characteristics. Square wave signals used in digital circuits can have a comparatively high frequency component included. This capacitor is used to bypass the high frequency to ground. 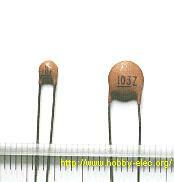 In the photograph, the capacitance of the component on the left is displayed as 104. So, the capacitance is 10 x 104 pF = 0.1 µF. The thickness is 2 mm, the height is 3 mm, the width is 4 mm. The capacitor to the right has a capacitance of 103 (10 x 103 pF = 0.01 µF). The height is 4 mm, the diameter of the round part is 2 mm. These capacitors are not polarized. That is, they have no polarity. In these devices, polystyrene film is used as the dielectric. 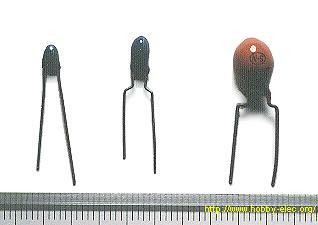 This type of capacitor is not for use in high frequency circuits, because they are constructed like a coil inside. They are used well in filter circuits or timing circuits which run at several hundred KHz or less. The component shown on the left has a red color due to the copper leaf used for the electrode. The silver color is due to the use of aluminum foil as the electrode. The device on the left has a height of 10 mm, is 5 mm thick, and is rated 100pF. The device in the middle has a height of 10 mm, 5.7 mm thickness, and is rated 1000pF. The device on the right has a height of 24 mm, is 10 mm thick, and is rated 10000pF. These devices have no polarity. This is a "Super Capacitor," which is quite a wonder. The capacitance is 0.47 F (470,000 µF). I have not used this capacitor in an actual circuit. Care must be taken when using a capacitor with such a large capacitance in power supply circuits, etc. The rectifier in the circuit can be destroyed by a huge rush of current when the capacitor is empty. For a brief moment, the capacitor is more like a short circuit. A protection circuit needs to be set up. The size is small in spite of capacitance. Physically, the diameter is 21 mm, the height is 11 mm. Care is necessary, because these devices do have polarity. This capacitor uses thin polyester film as the dielectric. They are not high tolerance, but they are cheap and handy. Their tolerance is about ±5% to ±10%. Care must be taken, because different manufacturers use different methods to denote the capacitance values. Here are some other polyester film capacitors. These capacitors have no polarity. 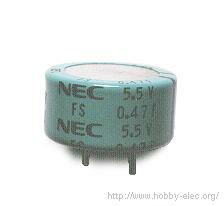 This capacitor is used when a higher tolerance is necessary than polyester capacitors offer. Polypropylene film is used for the dielectric. It is said that there is almost no change of capacitance in these devices if they are used with frequencies of 100KHz or less. The pictured capacitors have a tolerance of ±1%. When I measured the capacitance of a 0.01 µF capacitor with the meter which I have, the error was +0.2%. 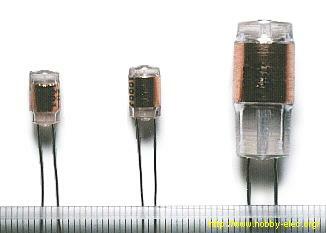 These capacitors use Mica for the dielectric. Mica capacitors have good stability because their temperature coefficient is small. 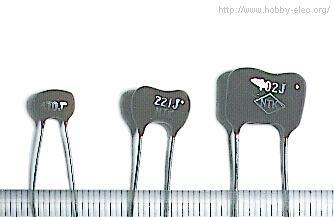 Because their frequency characteristic is excellent, they are used for resonance circuits, and high frequency filters. Also, they have good insulation, and so can be utilized in high voltage circuits. It was often used for vacuum tube style radio transmitters, etc. 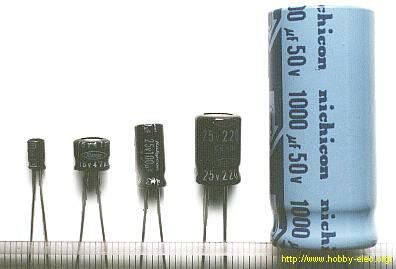 Mica capacitors do not have high values of capacitance, and they can be relatively expensive. Pictured at the right are "Dipped mica capacitors." These can handle up to 500 volts. These capacitors are a kind of a polyester film capacitor. Because their electrodes are thin, they can be miniaturized. Care is necessary, because the component lead easily breaks off from these capacitors. Once lead has come off, there is no way to fix it. It must be discarded. Variable capacitors are used for adjustment etc. of frequency mainly. On the left in the photograph is a "trimmer," which uses ceramic as the dielectric. Next to it on the right is one that uses polyester film for the dielectric. The pictured components are meant to be mounted on a printed circuit board. When adjusting the value of a variable capacitor, it is advisable to be careful. One of the component's leads is connected to the adjustment screw of the capacitor. This means that the value of the capacitor can be affected by the capacitance of the screwdriver in your hand. It is better to use a special screwdriver to adjust these components. Their are different colors, as well. Blue: 7pF (2 - 9), white: 10pF (3 - 15), green: 30pF (5 - 35), brown: 60pF (8 - 72). The components in the photograph on the right are used for radio tuners, etc. They are called "Varicons" but this may be only in Japan. 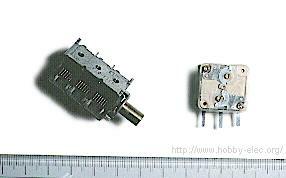 The variable capacitor on the left in the photograph, uses air as the dielectric. It combines three independent capacitors. For each one, the capacitance changed 2pF - 18pF. When the adjustment axis is turned, the capacitance of all 3 capacitors change simultaneously. There are various kinds of variable capacitor, chosen in accordance with the purpose for which they are needed. The pictured components are very small. To the right in the photograph is a variable capacitor using polyester film as the dielectric. 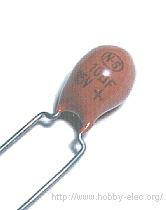 Two independent capacitors are combined. The capacitance of one side changes 12pF - 150pF, while the other side changes from 11pF - 70pF. The pictured device also has a small trimmer built in to each capacitor to allow for precise adjustment up to 15pF.